The government is providing yet another opportunity for people with black money to come clean at a total cost of 50% and having a quarter of their unaccounted wealth locked up for four years, warning that they'll be slapped with a penal 85% charge if they don't take advantage of this and get caught subsequently. Income-tax law amendments have been moved to enable the window, which will involve the establishment of the Pradhan Mantri Garib Kalyan Yojana, 2016, and allowing declarants to keep the source of funds deposited in banks from November 10 a secret if they use the option. PM Narendra Modi had announced the demonetisation of Rs.1,000 and Rs.500 notes on November 8 as part of a campaign against black money, counterfeiting, corruption and terror financing. Banks started accepting deposits in old notes from November 10. “Tax department will not ask for the source of funds deposited in banks... if the entire income is declared and 50% taxes paid on it,“ Revenue Secretary Hasmukh Adhia said. 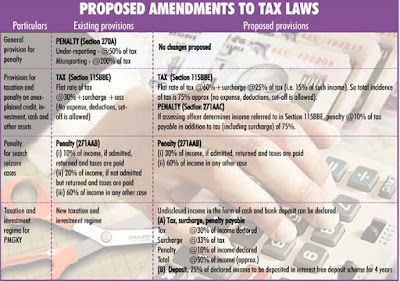 The 50% levy is broken up into 30% tax, a 33% surcharge or cess on that tax and a 10% penalty .The scheme, to be notified after the passage of the Bill in Parliament and Presidential assent, has features almost similar to the recent Income Disclosure Scheme that provided immunity from prosecution as also provided assurance to not reveal identity of depositors. Under the scheme, undisclosed income in the form of both cash and bank deposits can be declared. The move was prompted by a surge in deposits and a perceived ambiguity about applicable taxes. The 33% surcharge will be called the Pradhan Mantri Garib Kalyan Cess while the 25% deposit will go into the Pradhan Mantri Garib Kalyan Yojana. The money will be used for programmes dealing with irrigation, housing, toilets, infrastructure, primary education, health and livelihood. Section 115BBE that deals with taxation and penalty of unexplained credit, investment, cash and other assets is also being made tighter to penalise those who do not come clean. Under the proposed regime, in such cases a flat 60% tax plus a surcharge of 25% on that amount will be levied -making for a total of 75%. But the assessing officer is empowered to add a 10% penalty over and above this in certain situations, taking the total to 85% in such instances. Currently , this Section provides for a flat tax of 30% plus surcharge and cess. For those caught with unaccounted income or assets during search and seizure, existing penalty provisions under Section 271AAB of the income-tax law are proposed to be amended to make them more stringent. 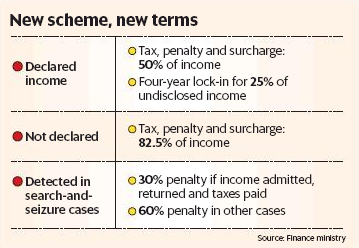 In cases where tax evasion is admitted, 60% levy will be charged (30% tax plus 30% penalty). In every other case, the levy will be 90% (30% tax plus 60% penalty). Currently , under this Section, penalty ranges from 10% to 60%. Tax experts said possible misuse of penalty provisions seems to have prompted the amendments. The general penalty provisions prescribe taxes of 50% for under-reported income and 200% for misreported income. However, the current general penalty provisions on under-reporting and misreporting will stay on the statute books as these will continue to apply in other situations. The revenue secretary said deterrent provisions were necessary to persuade people to declare their black money. He said the proposed amendment cannot be termed retrospective as the financial year is still on and people have not filed returns.